This week it is Learning Disability Week (18th – 24th June, 2018), and we are standing together with individuals, families, schools, colleges, and many other organisations across the country to speak up for the rights and needs of people with a learning disability. 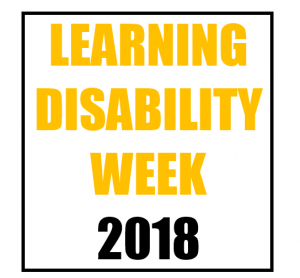 For this year’s Learning Disability Week there is a big focus on health and for good reason, as research shows that up to 1,200 people with a learning disability die avoidably in hospital each year. We know from the LeDeR programme (Bristol University) that there has been too little change, and that people with learning disabilities continue to die early, avoidable deaths, and that services not infrequently fail them. Families have campaigned tirelessly for change, in some cases, most notably the Justice for Laughing Boy campaign (#JusticeLB) which has brought a lot of public attention to the call for change. More recently, Mencap have launched the Treat Me Well Campaign and other organisations are also advocating for improved accessibility of health services for people with learning disabilities, including Dimensions with their My GP and Me campaign, which is providing training to GP surgery staff and working with policymakers to reduce health inequalities (#MyGPandMe). We join the many voices calling for better communication, clearer information and more time to be afforded to people with learning disabilities and their families when they (try to) access healthcare services in the community and in hospital to ensure they experience fair access to services and high quality care. We at the UCL Unit for Stigma Research (UCLUS) are particularly interested in understanding how prejudice and discrimination faced by people with learning disabilities and their families affect them and how they can be challenged. The link between stigma and health has been made by fellow researchers such as Hatzenbuehler (2013) who showed that stigma is a fundamental driver of morbidity and mortality in the general population because it can disrupt multiple life domains and have a pervasive and corrosive impact on well-being over time. We are currently investigating how to empower and support larger numbers of people with learning disabilities, not just those engaged in self-advocacy, to speak up for themselves against prejudice and discrimination. We have recently developed and piloted a new psychosocial intervention ‘Standing Up For Myself’ (STORM) which seeks to empower anyone with mild to moderate learning disabilities who wishes to engage with the programme to speak up for their rights, say no to bad attitudes and engage in actions to this effect. Our pilot study, just completed, has examined the effects of completion of the STORM programme on well-being and self-esteem with ten groups in the Southeast of England. We will be publishing our feasibility and preliminary results very soon. 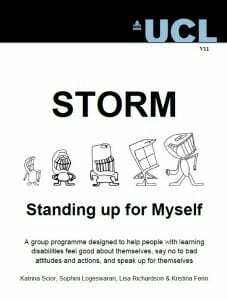 The STORM (Standing Up for Myself) programme is a manualised 4-session plus booster group-based intervention that seeks to empower people with learning disabilities to say ‘no’ to negative attitudes and discrimination. Some of the groups have continued taking action plans forward and are working with their local communities to raise awareness, including linking with local schools, training other professionals, and telling their local councils about the needs of people with learning disabilities. We are pleased to announce this Learning Disability Week our STORM End of Project and Celebration Event on Tuesday 4 September, 2pm to 5pm at UCL. We warmly welcome anyone interested in the STORM project and those who have supported its development to attend. At this lively, fully accessible event we will hear from the research team and from STORM participants, some of whom will talk about their experiences of the programme, others will present music or film based work they have produced inspired by STORM and its message that people with learning disabilities have the right and ability to speak up against injustice for themselves. This event is free but requires pre-booking.